A dedicated cargo hauler, the LAAT/c carries one of the most dangerous cargos in the Republic; the AT/TE walker. 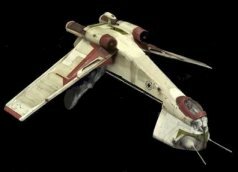 Unlike its counterpart, the LAAT/c is not particular effective in space battles, and usually is a target in those encounters, prey as opposed to predator. Once its powerful cargo is deployed, LAAT/c are normally withdrawn to the protective environs of its carrier. While encumbered with its large military cargo the Carrier uses the values to the right of the slash on its Combat Stats chart, reflecting its sluggishness.